Fun must be a big element in your business strategy. No one should have a job they don't enjoy. If you don't wake up energized and excited about tackling a new set of challenges, then you might be in the wrong job. Find job that challenges you. "Seek out jobs and assignments that challenge your mind. You will never find out what you are truly capable unless you have job that inspires you. 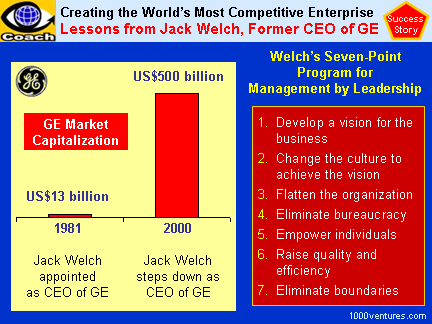 "2 When asked to give one important piece of advice for the new generation of managers, Welch answered, "Do your thing. I mean have fun. Do what you like. If you're doing something you don't like, get the hell out of it. Go live and do things and reach for the moon all the time. Have fun doing it and don't be afraid. Don't live in a box." Remove anything that makes people less excited about going to work. Business should be about passion and winning and creating new things. It doesn't have to be about slogging through bureaucracy and approvals and all the other things that make work so depressing. Celebrate success. “Business is ideas and fun and excitement and celebrations, and all those things.” Business has to be fun. For too many people, it's "just a job". Celebration is also a great way to energize an organization. A CEO's job is to make sure that his/her team is having fun – while they're being productive.